Bircher Reglomat, a global leader in sensing systems, offers a comprehensive Swiss engineered product line for safety aroundmachinery and robots. Our solutions provide higher performance, superior safety, and enhanced reliability. Industrial Safety Mats and Automatic Door Safety Mat Systems are used for intrusion detection into hazardous areas around manufacturing power presses, industrial plant machinery and robots. Industrial Safety Mats and Automatic Door Safety Mat Systems using Presence Sensing Detection results in a stop command being sent to machinery or robot controls. The presence of operators in hazardous manufacturing areas not visible from the industrial equipment controls location is also detected. In this case pressure sensitive industrial safety mats and automatic door safety mat systems prevent the industrial machinery and equipment from restarting. Industrial safety mats and automatic door safety mat systems consist of the safety mat itself and a safety mat controller to interface with the automated machine controls. 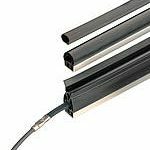 Pressure sensitive sensing edges or edge sensors are used as signaling and initiating devices on machinery or as safety devices where pinch points exist on automatic machinery doors. Edge sensors in signaling or initiating applications are typically actuated by an operator’s deliberate hand or foot motion. 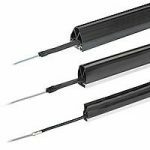 Edge sensors in safety applications stop or reverse automatic doors or moving machinery. These sensing edges offer cushioning to absorb door or moving machinery over travel that occurs between the stop command and the actual stand still of the motion. Sensing edge systems consist of the edge itself and an edge controller to interface with the equipment controls. Pressure sensitive safety mat and sensing edges must be wired into a controller to monitor for actuation and proper functioning. The controller provides the interface with the machine, robot or door controls. When the safety mat or sensing edge controller registers a sensor actuation or fault, a stop or reverse signal is sent to the equipment controls. Safety mats and sensing edges used in machinery and robot guarding applications are considered category 3 applications, requiring an ESD3 controller. Other controller selections should only be made based on your application risk assessment. Risk categories are defined in EN 954, Safety of Machinery – Safety Related Parts of Control Systems.